This highly practical manual, written by therapists with extensive experience in the field, provides a user-friendly reference tool for occupational therapists and others working with children who have problems with learning, co-ordination, speech and language and behaviour. 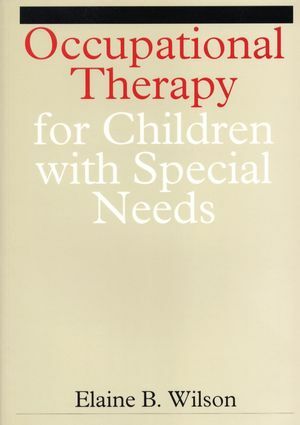 The book presents a model of a recognised approach from which therapists and others can develop specific techniques within a clinical setting, modifying the programme to meet the needs of the individual child. The treatment described has been used successfully by teachers and parents as well as by occupational therapists and OT students. Elaine Wilson is the author of Occupational Therapy for Children with Special Needs, published by Wiley. Part 1. Background to Sensory Integration, Elaine B. Wilson. Which Children Benefit From Treatment?. What are The Potential benefits of Treatment?. Part 2 Assessment Procedures, Helen Edwards. Defining the Problem, Assessment Procedures. Part 3. The treatment Session, Elaine B. Wilson. How Many Children can you Treat at Once? Difficulties That may Arise in any Treatment Session. Management of Behaviour in The Treatment Session. Treating Children With Other disabilities. Part 4. Behaviour Management in Young Children - a Therapist's guide for Parents, Joanna Nicklin. Part 5. Food and Chemical Sensitivities, Jenny Bennett. A day in The Life of a Child who is Food- and Chemical-sensitive.